When life gives you reading weeks, give it pancakes. At least that’s what I say. Raw, vegan, banana pancakes to be exact. 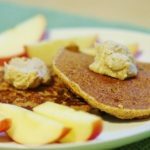 This recipe feels like a small triumph to me, because I’ve been searching for a raw, vegan pancake recipe that I like for a long, long time. My first experiment was with Ani Phyo’s raw flax and coconut oil pancakes (from her first book), which were delicious, but frankly much too heavy for me. I like staying full after breakfast, but not 8 hours worth of full—what about lunch!? My next experiment was a simple mix of banana and flax. 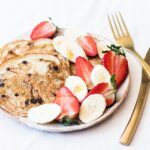 This seemed right for me—banana is my favorite breakfast fruit, the ingredient list was short, the process was easy—but what I ended up with was closer to a fruit leather than a pancake. (You may remember it. I renamed it a “crepe” and posted the recipe about a year ago. Now you know.) I was disheartened: the only other pancake recipes I found sounded a lot like raw bread, and I really did want something that was hearty, but light and thin the way pancakes ought to be. I think I’ve found it—or at least, I’m one step closer. These banana pancakes are a good in-between: they’re filling and dense, but they also have a pliable texture. And they make a lovely presentation. Best of all, they are ridiculously, totally, embarrassingly easy! If you ignore the dehydration time, these guys are really a lot easier than normal pancakes. And when you’re trying to figure out molecular orbital theory, easy is much appreciated. 1) Blend all ingredients together in a blender or food processor. The mix should be similar to regular pancake mix; if you need more almond milk, go ahead and add it. 2) Pour in 1/4 cup spoonfuls onto a Teflex lined dehydrator tray. You should get about 5 pancakes. 3) Dehydrate at 115 degrees for about 2 and a half hours. Flip the pancakes (use a spatula or inverted spatula) and dehydrate for another two and a half. It’s *very* important not to over-dehydrate here, so check the pancakes often. If you let them go too long, you’ll end up with banana flax crackers. And while those will be scrumptious, they won’t exactly be pancakes. 4) Serve with fresh berries! A lot of you are probably experimenting with more raw foods now that summer’s on the way, and that’s great. 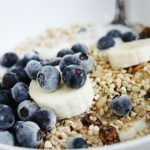 I know that one of the bigger challenges for the newly raw can be adjusting to cool breakfasts—it’s easy to get tired of smoothies, which don’t always offer much in the way of satiety and texture. If you’re exploring more raw breakfast options, I really suggest giving these guys a try! They’re delicious and oh-so-quick. 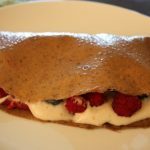 And if you’re not in the mood for pancakes, check out this post from the archive on some of my top breakfast ideas. 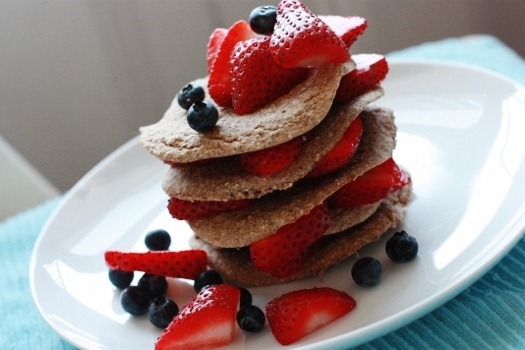 These pancakes look incredible!! Perfectly formed. I know this would defeat the purpose of these pancakes being raw, but sine the ingredients seem rather similar to those of your typical pancake, do you think they could be made in a pan on the stovetop? Or, because I know that a lot of dehydrator recipes can be made in the oven, do you think they could be baked? I’m a fool for anything involving bananas, so I’d really like to make these! I’m also gluten-free at the moment, so they’d make my tummy especially happy these days. An oven set at 300 would work great. And honestly, Jen, you know that I’m not a purist about raw vs. cooked so long as ingredients are health-giving, so go ahead and add some baking soda and fry these, if you wish! Fantastic! I don’t like anything too filling for breakfast either. These look perfect! Yum! Thank you so much for these…You probably know that they are similar to Brendan Brazier’s amazing pancakes (for those of you unfamiliar, see his books Thrive and Thrive Fitness), which are my favorite pancakes EVER…(@Jen, they are cooked pancakes and they may appeal to you.) I’ve been playing with them to try to create a raw version but haven’t quite hit it, so I’m excited to try these. Thanks, Gena. oooh la la! these look scrumptious! Mmm, yummy. I’d throw some cashew creme on top too, because pancakes with whipped cream and berries is the best breakfast ever! Edible Perspective is big on buckwheat breakfast bakes. I’ve been eating these vs. my smoothies given our still cold, wet weather. The basic ingredients are the same as your pancakes, except with less milk. I’d like to move towards lighter, higher raw food again. Wish the weather would cooperate! Looking forward to a warm weekend and making these pancakes. Is it weird to compliment you on your photography? It keeps getting better and better! Not weird! I’m a total hack, but thanks! yum! Thanks for reminding me to buy some buckwheat! These are my kind of pancakes. I love recipes that don’t have a lot of ingredients. I can’t wait to make these. Your photos are very nice too! Molecular orbital theory? Yes! I just took a class on that this semester with computer modeling: so awesome. But I understand, and I’m glad you posted such an excellent-sounding recipe! That recipe is just perfect, right up my street! have you ever tried dehydrating in an oven set at a low temp? it’s the only option I’d have and I REALLY want to make them! ug, I was hoping there wasn’t a dehydrator involved. Not to worry, AnneMarie. You can certainly make this with an oven set to 300 degrees, or just make them traditionally. 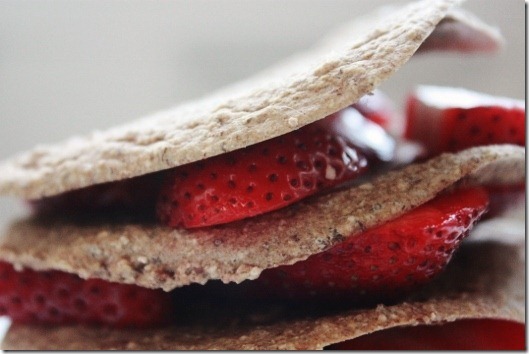 I remember your breakfast crepes…time flies! The pancakes look great and I love that they only took 2 hrs in the dehyd, not 14. haha! I have made banana crepes before in my dehyd with pureed banana, almond flour, flax seeds, cinn & sugar. I have never actually made pancakes. I just smear the whole huge mixture on the dehyd screens and wait…I need to form cute little pancake shapes like you did. This sounds like pancake batter, which is the best part of pancakes, imo! Can I eat the raw batter raw? 😉 We make cooked pancakes very similar to these, too. If I’m reading the instructions completely, dehydration takes 5 hours total. Can these be made the evening before and refrigerated overnight? I can’t wait 5 hours for breakfast. 😉 Thank you! I appreciate their raw-ness, but I’d probably just grill them. i’m loving how simple they are! Any idea how long they would take in an oven set at 300? I don’t want to wait nearly 5 hours for breakfast! I was hoping they wouldn’t have any banana in them! Oh well. I am striving for a raw pancake without banana, because we’ve got an allergy in the family. I wonder if another fruit might work instead. 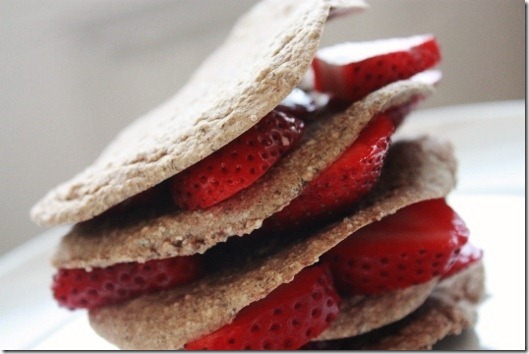 I like the idea of buckwheat flour in there. And I agree with the other commenters, pretty pics! I have to warn the folks who want to just grill them, I tried that with a raw recipe once that was almond flour based and it was a huge mess. It seems a little frustrating that a lot of commenters wants to make them in an oven and expect you to have figured all that out. 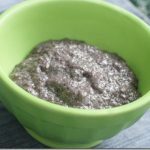 People need to sometimes just accept that dehydrator recipes are pretty specific for dehydrators, and if they are trying something out that’s different, they will have to experiment themselves. So easy and yummy looking! My dehydrator needs some love. I think it’s getting dusty. Also, I can’t believe there’s a meal that held you over for 8 hours! And a breakfast at that! I’m about to go search out her recipe in my cookbook stash and find out what else was in there. And for those of us on the opposite end of the world, entering winter, posts like this are a good incentive to stay raw in the cold! Great minds (and chefs) think alike. I have been cruising my uncookbooks and the web in search of raw banana pancakes that don’t turn into fruit leathers… Buckwheat and bananas, what a perfect combination. I know what I am having for breakfast tomorrow. Good luck with the finals, Gena. Looks wonderful! Thank you for sharing your recipe. I look forward to sprouting some buckwheat, drying it and making sprouted flour for these yummy flap jacks! 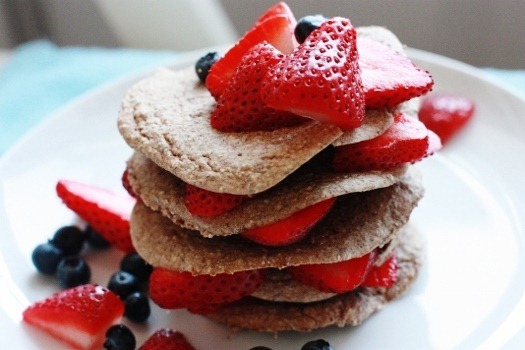 I’ve been wanting to try raw pancakes! These look wonderful! So true on smoothies, as much as I love them on week mornings, they’re tiring on weekends. But I still want a raw breakfast so I can’t wait to try this. Thanks! Gena – you are a golden breakfast godess. Thank you for this recipe! Will they keep well in the fridge? Sounds yummy! I’m so ready to get a dehy at long last–and I’ll have to try something like this when I get it. Last I tried, buckwheat didn’t like my tummy (some people with celiac can’t do buckwheat) but Bitt told me it works better for her ground up than whole, so might be worth another try. Good luck with all the exams and understandings! Gorgeous. Cannot wait to try these!! We have not made raw pancakes in awhile…yum! As soon as I add bananas back in my diet I am making these. We have made raw pancakes out of bananas before, love how easy they are to make. Thanks for sharing. I love pan cakes and as a kid I remember eating them together with my friends in our house and my mom can’t finish cooking more!!! I just made them for dinner! Awesome! Topped them with organic raspberry jam and pure maple syrup. They needed to dehydrate an extra 3 hours for me but that’s probably because Ottawa is super humid right now. I tried to make nice smooth flour from buckwheat groats with my food processor, but it was still lumpy. Now I’ve got a super blender and so the pancakes turned out silky smooth! Thanks for the awesome recipe! I am thinking of making these in advance for a brunch… how long do you think the pancakes will keep? How should they be stored? Thanks! Hey Gena, So I made these and they took longer to dehydrate than yours but turned out really well. The pancakes did oxidize as leftovers, but I think they could safely be made a day in advance. Delicious straight from the dehydrator, though! This is my version with maca! Whoa. I think that I’m in love with you! I had been searching for raw pancakes. So far I’ve just made the batter – but it’s DELICIOUS!!!! Would you mind if I played around with the recipe and posted a version on my website? I’ll absolutely say they’re based from your recipe. I’m SUPER hopeful. They were so delicious I’ve just made batch #2! These look great and I look forward to trying them when I get the dehydrator I ordered (it has 5 round trays). 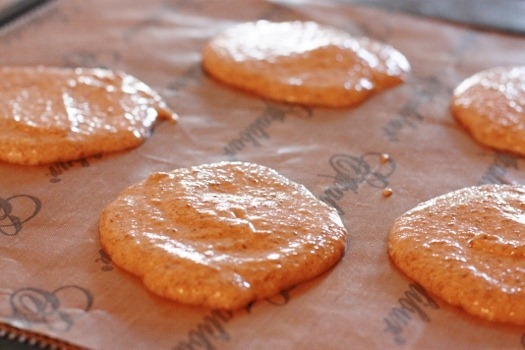 Can you tell me what type of sheets I should buy and use when making these and other cookies? Can I use ordinary greaseproof paper or baking paper which is silicon based non stick? I’ve never used a dehydrator before. completely with a healthy lifestyle but you live in areas with harsh winters or frequent rain. Hi! I tried to make them but at 2 hours they were still so sticky and soggy I couldn’t even flip them. I put them on parchment paper, not sure if that makes a difference. It was the first time using my dehydrator so I am feeling discouraged lol! I don’t think almond milk is raw.. But the recipe looks great.